A delightful coastal road trip, discovering pretty villages, beautiful beaches and fascinating historic sites. join me as I explore Moray and Aberdeenshire. It’s safe to say I’m going stir crazy waiting for 2018’s road trips to get underway. It feels like months since I felt the familiar buzz of excitement I get when we load the car and leave town. This rare quiet spell means I can write some of the blogs I never got round to writing in the whirlwind that was 2017. 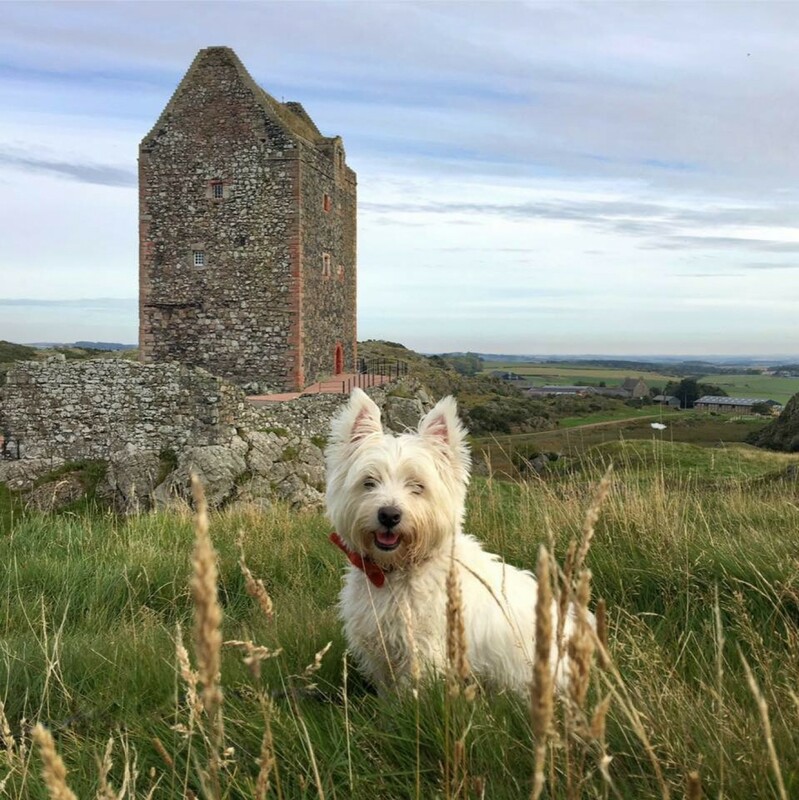 So, today I’m going to take you on a jaunt along the beautiful Moray and Aberdeenshire coast, to share a day trip we enjoyed in October during a two night stay in Nairn – Mr G’s Highland hometown. Our base for the weekend was the dog friendly Hay Lodge B&B. We’ve stayed there a few times over the years and always find a warm welcome, a comfortable room and a great breakfast. Sticking to our usual routine of an early breakfast, we were on the road by 8:30am – it was a grey, flat sky day but we didn’t care as we had hours of exploring ahead of us – hooray. We managed to drive for 10 whole miles before stopping at Forres to explore a little of the town’s dark past. Outside the police station we visited the Witches Stone. Once upon a time when the belief in witches was rife in Scotland, the townsfolk of Forres would roll unfortunate souls accused of witchcraft down Cluny Hill in a heavy, wooden barrel with spikes driven through it. When the barrel stopped rolling it was set on fire. The witches stone marks the spot of one such hellish execution. It’s hard to comprehend such barbaric acts today, but you have to remember that these were extremely superstitious times, and there was an absolute belief that witches were real and in cahoots with Auld Nick. Back on the road, we passed several amusing sculptures made using hay bales, for an annual Young Farmers competition. We couldn’t resist pulling over for a closer look at a giant man-eating spider bale. The boy agreed to pose for a photo, but only from what he deemed to be a safe distance. We weren’t on the road long before we were distracted again – this time the historic railway station in Keith caught our eye. The station sits at one end of The Whisky Line – an 11 mile stretch of track connecting Keith and Dufftown. Vintage trains run up and down the track, offering whisky samples on board. Sadly, we didn’t haven’t time for whisky tours, so off we went leaving Moray and crossing into Aberdeenshire. By the time we arrived in the coastal village of Portsoy it was raining. It was miserable, but we weren’t going to let a spot of torrential rain put us off. I adore Aberdeenshire villages, especially the ones that cling to the sea. Portsoy is a delight, even on a dreich day. The village stole the show in the 2016 remake of the classic movie Whisky Galore when it was transformed into the fictitious island of Todday. Although substantially more built up than Eriskay (the real life Todday), Portsoy was believable as an island. Despite the rain we pottered around the village and climbed Durn Hill – a small, prominent hill that looms over it. The hill is the site of an ancient hillfort, and now a great viewpoint for gazing wistfully out to sea. The boy, snuggled up in his fur-lined jacket enjoyed a sniff around Portsoy’s tiny beach, before we all bundled back into the car, dripping wet. We left the coast for our next stop of the day. The historic Aberdeenshire village of Fordyce lies one mile from the coast. It’s a chocolate box, pretty village with quaint cottages, a castle and a picturesque ruined church. Fordyce is known to have been a place of worship since the 6th century, when a church dedicated to St Tarlarican was build there. The church ruins that stand in the village are thought to date to the late 13th century. Maybe St Tarlarican took pity on us, as we were sheltering from the rain inside the churchyard when they sky turned blue. Miracles do happen! Fordyce Castle stands next to the village’s ancient kirkyard. The castle was built in 1592 for Thomas Menzies, a wealthy merchant and Provost of Aberdeen. The castle, which is now privately owned has been remarkably well-preserved and is a striking focal point in a lovely village. Keen to stretch our legs properly, and make the most of the unexpected dry spell we headed back to Moray to the coastal town of Cullen. Parking in the centre of town we made our way down towards the seafront, passing under the giant arches of the Cullen Railway Viaduct. We stopped at a vantage point to take in the view of the fishermen’s cottages below us, and the arches of the viaduct stretching off into the distance. Down by the harbour the sea was crashing, angrily off the sea wall. I love watching the sea. We stood for a while, hypnotised as the tide ebbed and flowed. The power of the sea is always so awe-inspiring and has the ability to make you feel tiny and insignificant with the crash of each wave. We followed the coast towards the distant viaduct arches. The 19th century viaduct is a remarkable feat of railway engineering, and although the trains stopped running in 1968 the track is now a foot and cycle path which links Cullen and Portknockie. The boy was delighted to find a good stretch of beach to run on. A game of chase, and some fast running later and he was as happy as a sandboy (quite literally). The focal point of the beach isn’t the golden sand, it’s a group of seas stacks known as The Three Kings. They’re just crying out to be photographed – we willingly obliged. Hungry from the sea air, we walked back to the upper part of town in search of a dug friendly eatery. We found a small cafe on the High Street which fitted the bill perfectly. We were soon tucking into soup, sandwiches and a mug of hot coffee each. Now, if the name Cullen rings a bell it’s probably because of the town’s famous soup – Cullen Skink. Cullen Skink is a milky concoction containing butter, smoked haddock, potatoes and seasoning. Having been forced to eat smoked fish in a milky sauce as a child it’s my idea of hell. Even the smell of it is enough to make my stomach heave. Mr G loves it as much as I loathe it, so he tucked into a hearty bowl for lunch as I struggled valiantly to eat whilst holding my breath! The boy, it seems is also a fan as he wolfed down some haddock and potato scraps offered to him. With the smell of smoked, milky fish still lingering in my nostrils, it was time to leave the lovely town with the stomach churning soup. It’s impossible to drive by Portknockie knowing that Bow Fiddle Rock is there. As usual we were lured in like moths to a flame to photograph the odd rock formation that resembles a fiddler’s bow. The boy goofed around trying to impersonate the rock – I think he pulled it off remarkably well, don’t you?! We crept into a cave near the rock and watched as the sea rushed in, then out again. It was hugely satisfying to watch, trying to guess if the next surge of sea water would bring with it a powerful roar or a whimper. The boy had been as good as gold, so he’d earned himself more beach time. Roseisle is a gorgeous, long stretch of beach, fringed by coastal pine forest. It was all but deserted when we arrived, which suited us just fine. The boy was in his element and wasn’t sure whether to pursue the interesting scents coming from the forest, or to do his usual crazy beach running. In the end he compromised with a spot of each. Roseisle reminds me of the pretty East Lothian beaches, closer to home. Like many of them it still has huge, concrete blocks on it – a remnant of Britain’s WWII sea defences, placed there to hamper amphibious landings. With the afternoon drawing on we weren’t ready to head back to Nairn quite yet. There was still time to indulge in a spot of history geekery. Burghead is a small town, with a fascinating history. It was once the site of a hugely, significant Pictish fort. Perhaps it’s creepiest historic site is Burghead Well, an unmanned site in the care of Historic Environment Scotland. To visit you need to collect a key from a coffee shop in the village. Against my better judgement I did just that. The well gives me the heebie-jeebies. Visiting it is like teetering on the edge of your own dark grave. Peering inside, the blackness takes your breath away until your eyes begin to acclimatise – then horror upon horror before you is a pool of pitch black water. I’m not selling it, I know! It’s not known who made the well, when it was made, or what it was made for. There are various theories about its original purpose, including a shrine to Celtic water gods, a place where ritual executions took place, an early Christian baptistry or a Pictish cult centre, later claimed for Christian use. Whatever it was, it’s steeped in mystery and more than a little terrifying. Glad to see the back of the creepy, dark well we took a stroll along the seafront, skirting the impressive turf defences of the Pictish fort. Judging by the scale of the surviving defences, the fort must once have been an impressive sight to behold. Viking raiders are known to have attacked Burghead in the 8th and 9th centuries. Oh, to be able to travel back in time to witness that unwelcome arrival. We wandered along the fort wall towards a small grassy hill on the edge of the town, known as Doorie Hill. On top of the hill stands a beacon, charred black by fire. If you didn’t know Burghead you could be forgiven if you were reminded of Wicker Man – especially if you’d just visited the creepy Burghead Well! The beacon is nothing sinister though, it’s linked to a 1,600-year-old tradition known as the Burning of the Clavie which sees in the old New Year on 11th January. A barrel dipped in tar is set alight and carried through the town to Doorie Hill. The smoke and flames from the clavie are said to ward off evil spirits. Fragments of the clavie are gathered by locals and placed up the chimney to bring luck, and ward off evil spirits. See, I told you there was a perfectly normal explanation for the charred beacon! With so many things to do in Moray and Aberdeenshire our road trip had been long and full of fun, but it was still light and while it’s light we roam. We ended our day with a visit to Findhorn for a wander on the beach. There were no impressive sea stacks or WWII anti-tank defences on this beach but it did have a colourful row of beach huts, and who can resist photographing beach huts?! Later, back in Nairn we spent a chilled evening with friends enjoying dinner and drinks as a plum-tuckered boy enjoyed a well-deserved snooze under our table. If you’ve enjoyed this jaunt in Moray and Aberdeenshire you can read more about the lovely Moray coast here and discover the beautiful villages of Aberdeenshire here. Excellent and brilliant as always. Now that I’m healing from spinal surgery, I’d like to get on the road too. We will think of the Wee White Dug and his family when we do. Thanks for sharing your trip along my home patch. Such a shame you didn’t come to Lossiemouth too and let the wee dug run on the beaches there. Lovely walk to the lighthouse and beyond to Sculptors cave. Aww I loved that programme, poor old Rheuben is over the rainbow bridge now. It’s a gorgeous cottage. We stayed at Uig on Skye at the Cowshed – a luxury hostel with fab glamping pods – en-suite and kitchen. The Ferry Inn is fab too can highly recommend. We’re staying again in Sept en-route to Harris and can’t wait. Yes CalMac are great. Very dog friendly. They have dog friendly seating areas inside and anywhere on the open deck is ok. Casper always makes pals on the ferry. Looks beautiful! Actually heading up the west coast to the island of North Uist in August. Have you ever been? We’re also getting cabin fever waiting for the touring season to start. Great post! The fickle weather is tantalizing, isn’t it – !